State Sen. Harry Brown (R-Onslow), with Sens. Kathy Harrington (R-Gaston, partially hidden, and Joyce Krawiec (R-Davie, Forsyth), explaining a school construction funding bill at a press conference. The North Carolina General Assembly got down to business Wednesday as lawmakers prepare for the budget-focused long session. Committee chairs were named and legislators from both parties unveiled their top issues, setting the stage, perhaps, for conflicting priorities. 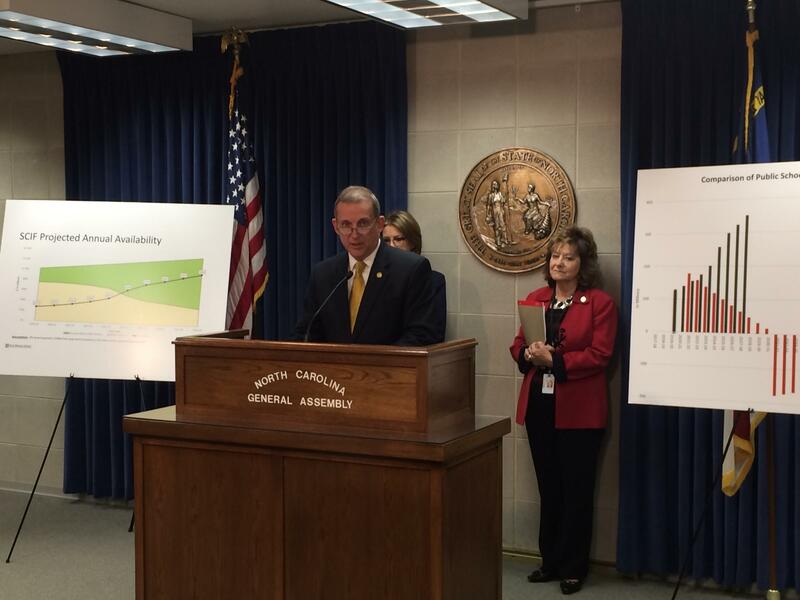 State Sen. Harry Brown (R-Onslow), along with two GOP collagues, held a press conference to introduce legislation he thinks provides a better way to fund school construction. Rusty Jacobs reports on the beginning of the 2019 Legislative session at the North Carolina General Assembly. "The bottom line is the Building North Carolina Future Act provides more money to schools, costs the state less, and delivers the funding faster than a debt-financed bond does," Brown said, claiming his bill would raise $2 billion dollars for K-12 school construction over the next nine years without creating more state debt. Instead of issuing a bond, construction money would come from the existing State Capital and Infrastructure Fund, or SCIF. SCIF is capitalized with money from the state's unreserved general fund balance, accrued interest on fund deposits and four percent of net general fund tax revenue. The bill would increase that to 4.5 percent. "We agree with our colleagues elsewhere in government that school capital is a priority. We just think that our plan is the right way to go," Brown said. Those colleagues include state Speaker of the House Tim Moore (R-Cleveland), who, along with Democratic Gov. Roy Cooper, backs a school bond proposal. "I think, given where we are with our credit, given where we are with how inexpensive money is right now, that a bond is a great way to go, as opposed to depleting capital," said Moore. House Speaker Tim Moore (R-Cleveland), talking to reporters on Wednesday, Jan. 30, 2019. While Moore and Brown may disagree on how to fund school construction, they see eye to eye on its priority status. But Democrats in the House and Senate have put another issue atop their legislative agenda. 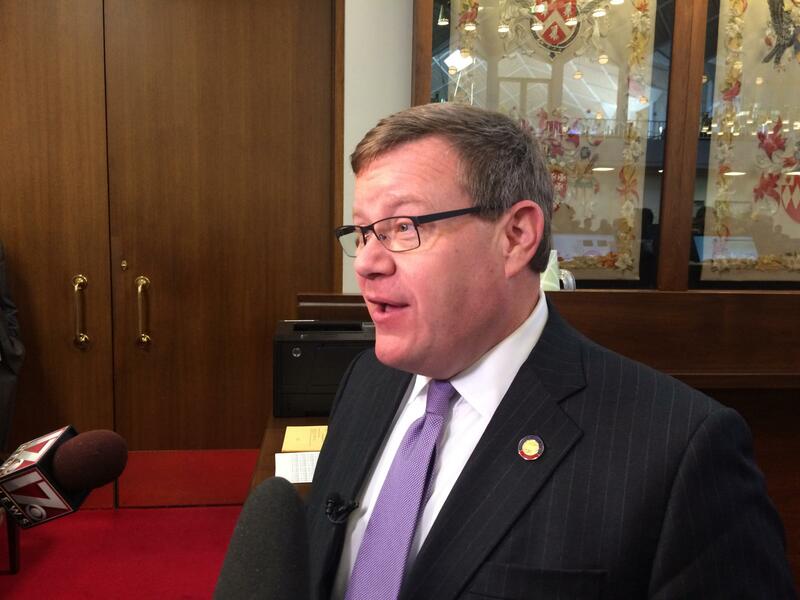 "Now is the time to expand Medicaid in North Carolina and close the coverage gap," said state Sen. Dan Blue (D-Wake), addressing reporters with dozens of Democratic colleagues from the Senate and House, as Medicaid expansion legislation was filed in both chambers. 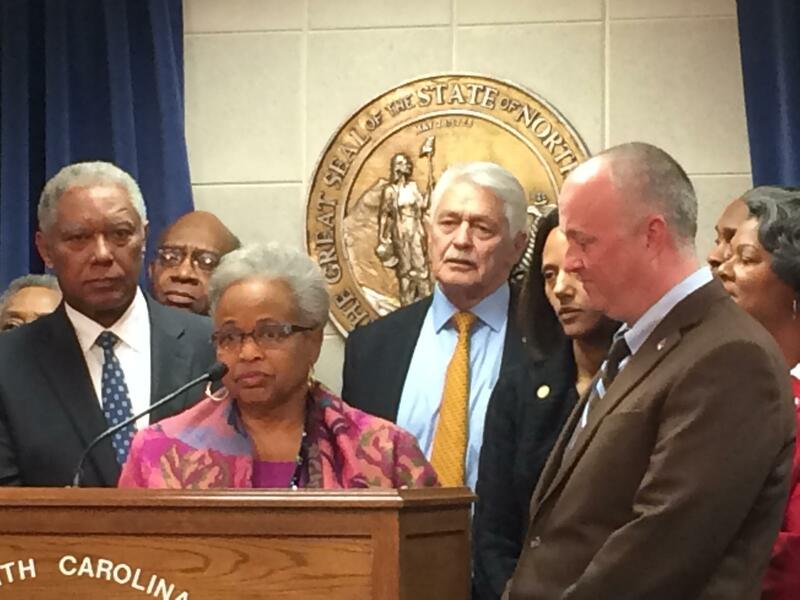 State Sen. Gladys A. Robinson (D-Guilford), at the podium, flanked by Senator Dan Blue, left, and House Democratic Leader Darren Jackson (D-Wake), right, talking to reporters about the Medicaid expansion bill she is co-sponsoring. Blue said he believes public support for expanding Medicaid coverage is widespread and that Republicans in the legislature will jump on board, too. "Everybody pretty much agrees that we're talking about a half a million North Carolinians who would basically have coverage available who don't have it available now," Blue said. And Blue said the altered power balance in the General Assembly will facilitate compromise. Democrats gained enough seats in November to break the GOP veto-proof majority. But House Speaker Tim Moore still needs convincing on Medicaid expansion. "I don't see us going down the road of some sort of blanket Medicaid expansion, I don't support that," Moore said. To close the coverage gap, it looks like Democrats will have to bridge a partisan gap first.